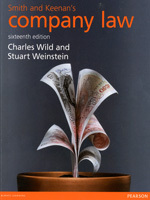 Smith & Keenan's Company Law, 16th UK ed. Combining clarity and accessibility with detailed coverage of this often complex subject, Smith and Keenan’s Company Law offers a readable guide to all aspects of company law. In addition, the broad range of end of chapter questions and clear case summaries have been retained from previous editions, as has the additional resources in mylawchamber, offering you a company law text with unrivalled study support in the book and online.